Guava Family Presents The GoCrib! If you have a child, you probably have a portable crib. You also probably paused before the last time you used it, wondering if it was really worth lugging it out of the closet. Too big. Too heavy. Too much trouble. Too…not portable. You also probably wondered instead if you could arrange for one on the other side of your travels. In fact, some of us even had two… one at home, and a second one we bought for our parent’s house, specifi- cally so we DIDN’T have to travel with it. We paid for two portable cribs, simply because we didn’t like using them. Where is the logic in that??? Guava Family was born in 2008 to inject logic back into an illogical situation. We started by stepping back and throwing out how all portable cribs had been made before. Instead we spoke to other family members, friends, and parents. We listened, we observed, we prototyped. We threw out prototypes and started again. Eventually we learned a few things. Here is what you wanted (well…not you specifically. the collective you). A portable crib should be light and compact so it’s ultra-portable, and so you can carry it hands-free. It should be safe. It should be a soft, protective area, but still strong, rigid and sturdy. It should be easy to setup, and just as easy to take down. It should also be fun and inviting for your children. After-all, it’s they who spend time in it, not you. In 2010, as a result of this iterative design process, we introduce the GoCrib. 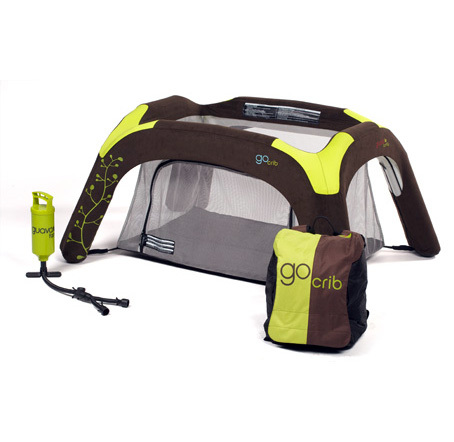 The GoCrib is a revolutionary, standard-size portable crib that comes in a backpack. Its rigid-inflatable airframe technology creates a light-weight, yet strong and safe environment for your child that packs so small that you can take it anywhere, move it around with ease, and finally free yourself of the heavy, cumbersome travel cribs of the past. And, with its creative side door, it morphs from a safe and secure place to a fun play area as your child grows. The GoCrib is so portable and so fun that you will re-imagine how and where a portable crib can be used. Visit Guava Family for details on purchasing your own GoCrib! The GoCrib is $249.99 and free shipping! Like Guava Family on Facebook! Follow Guava Family on Twitter!